Fives recently finalized the acquisition of the Bryant Grinder’s technology and intellectual property, expanding its expertise to the design and manufacture of high-precision/high-production inner-outer diameter grinders. Fives will also provide aftermarket services for the existing installed base. Bryant Grinder first began as an independent machine tool builder as Bryant Chucking Grinder Company, founded in 1909. The Bryant Grinder range of technologies and services will be legally operated out and developed by the resources (sales – engineering – assembly – field service) of Fives Landis Corp. Hagerstown, MD, USA company of Fives. Prior to this acquisition, Bryant Grinder was owned by Vermont Machine Tool. Products mainly include dedicated internal diameter (ID) and outer diameter (OD) high-precision/high-production grinders, universal ID/OD (bore/seat/face) grinders, and CNC operating systems. Fives will also provide the full range of services to the installed base (parts, field service and machine remanufacture). This expertise of specialized precision grinders will allow Fives to enhance its current offer serving to the bearing, drive train, fuel systems, medical and valve train industries. 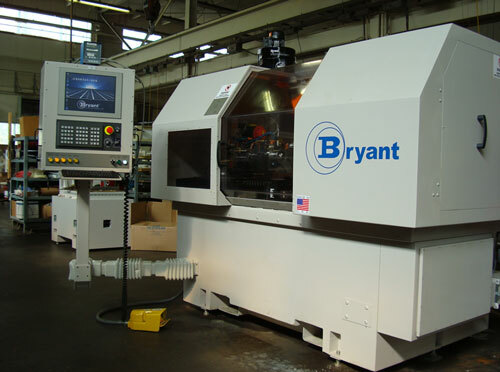 Bryant Grinder is known for originating the motorized wheel spindle and the “Revelations®” CNC operating system. This system utilizes a single operator and programmer screen and offers unlimited part programming capability. The Bryant Grinder intellectual property technology includes the “round bar” hydrostatic way systems. The extremely stiff, round hydrostatic bearing controls the slide in all degrees of freedom and has an ultra-low way to carriage coefficient of friction resulting in dimensional, geometric and sub-micron positioning accuracy. This technology was expanded with the design of the round bar “Hydro-Truc™” bearing which allows standard, modular slide assemblies.